If you're a car enthusiast, now is your chance to get your hands on a Lamborghini for under six figures. But, there's a catch. SAN DIEGO (CBS 8) - If you're a car enthusiast, now is your chance to get your hands on a Lamborghini for under six figures. But, there's a catch. 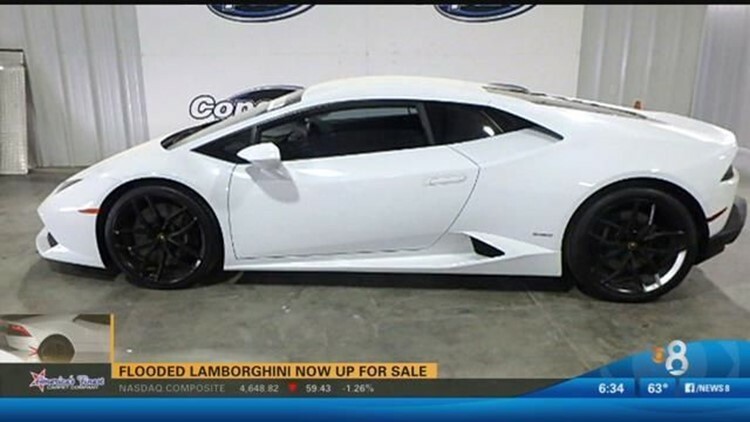 A white Lamborghini, originally worth about $270,000, is on sale for $75,000 on Copart.com, a salvage car auction site in Otay Mesa. However, the listing says the car has suffered primary flooding damage. CBS News 8 believes this might be one of two white Lamborghinis which were damaged in past storms. In September, a white Lamborghini was found submerged inside a residential parking garage in Ocean Beach. Autobahn co-owner Sean Steele says that the Lamborghini listed on Copart is probably the same vehicle. "It's the same paper license plate that on the one in Copart. So, unless both cars had the same plate, which I doubt, you know. Plus, it's white with black rims. It should be that one," said Steele. The second white Lamborghini was recorded in a video, which later went viral, charging through a flooded street during January's storm. "I couldn't believe the guy tried to make it. I can't believe he did make it," said Sean. In regards to the Lamborghini listed on Copart, Steele says the car may have suffered severe flooding damage. "There could be water in the engine, in the transmission. If there is water in the interior where the electronics are, chances are it's going to have some pretty substantial damage," said Sean. Ocean Beach neighbors told CBS News 8 that the owner of the Lamborghini that flooded in September replaced it with a black Lamborghini. The auction for the 2015 Hurricane starts on Friday.